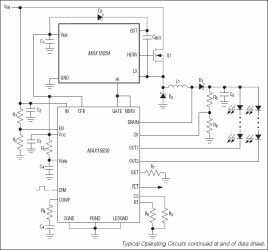 Create a design and simulate using EE-Sim® tools: The MAX15054 is a high-side, n-channel MOSFET driver for high-voltage applications capable of switching at high frequencies. This device is controlled by a CMOS logic-level signal referenced to ground and features a very short (12ns, typ) propagation delay from input to output. The high-voltage operation and high source/sink-current capability make the MAX15054 ideal for HB LED drivers and DC-DC converters. The MAX15054 is well suited to complement other Maxim LED driver products such as the MAX16814, MAX16838, MAX16833, MAX16834, and MAX16826. The MAX15054 adds a high-side driver to those products that include only a low-side driver; it then allows for buck-boost configurations for multistring drivers similar to the MAX16814, MAX16838, and MAX16826, and for buck-boost conversion with output referenced to ground for single-string drivers such as the MAX16834 and MAX16833. The MAX15054 is available in the industry-standard 6-pin SOT23 package and operates over the -40°C to +125°C automotive temperature range.